Sticky toffee pudding has probably done more to elevate the status of British cooking than the collective celebrity of Nigella Lawson, Jamie Oliver, and Gordon Ramsay. Please note that here the word pudding is used in the British manner, denoting just about any dessert. 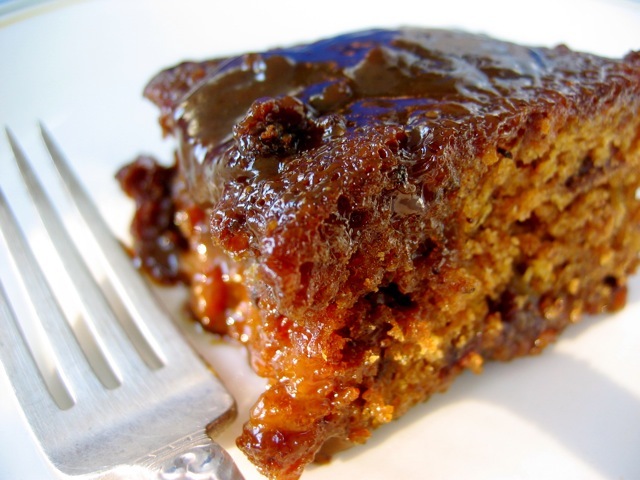 Therefore, this isn't soft and creamy like tapioca pudding, but a warm date cake smothered with toffee sauce. It is never better than when the crowning toffee sauce is made with demerara sugar, which has a toffee note of its own to begin with. Although its history is disputed, sticky toffee pudding was not a staple in the United Kingdom until recently. It has a Dickensian feel to it, and makes a wonderful finale to a grand Christmas dinner. Position an oven rack in the bottom third of the oven and preheat to 350 degrees. Butter an 8½-inch-diameter soufflé dish (see Culinate editor's note, below). Make the toffee sauce: Bring the cream, sugar, and golden syrup to a boil in a medium-size saucepan, stirring often to melt the sugar. Lower the heat to medium-low, stirring constantly, until the sauce is thick enough to coat the spoon, about 5 minutes. Pour half the sauce into the soufflé dish, and freeze to set while you make the pudding. Reserve the remaining sauce at room temperature. Make the pudding: Bring the dates and 1 cup plus 2 tablespoons of water to a boil in a medium-size saucepan over medium heat. Remove from the heat and stir in the baking soda (it will bubble up). Set aside to cool slightly. Sift the flour, baking powder, and salt together into a medium-size bowl. Using an electric mixer set at high speed, beat the butter and sugar in a second medium-size bowl until the mixture looks lighter in color, about 2 minutes. Gradually beat in the eggs, then the vanilla. (The mixture may look curdled.) Stir in half of the flour mixture. Stir in the warm date mixture, followed by the remaining flour mixture, and mix just until blended. Pour the batter into the prepared pan. Bake until a toothpick inserted into the center of the cake comes out with moist crumbs attached, about 50 minutes. Transfer to a wire cake rack. Let the cake stand about 15 minutes to cool, until no longer piping hot. Reheat the toffee sauce over low heat, whisking often. Spoon the cake and its toffee into individual dessert bowls, then top with the toffee sauce. Serve immediately. The cake and sauce can be made up to 1 day ahead, cooled, covered with plastic wrap, and refrigerated. If planning to make in advance, keep the cake in the soufflé dish. Before serving, preheat the oven to 300 degrees and reheat the toffee sauce in a saucepan over low heat, whisking often. Poke a few holes in the surface of the cake with a chopstick, and pour about half of the toffee sauce over the cake. Cover the cake with aluminum foil. Bake at 300 degrees until the cake is heated through, about 30 minutes. Divide the remaining toffee sauce over each serving. Culinate editor's note: If you don't have a large soufflé dish, a rectangular baking dish (8 by 12 inches is best) will work just as well. Check for doneness after 30 to 35 minutes.